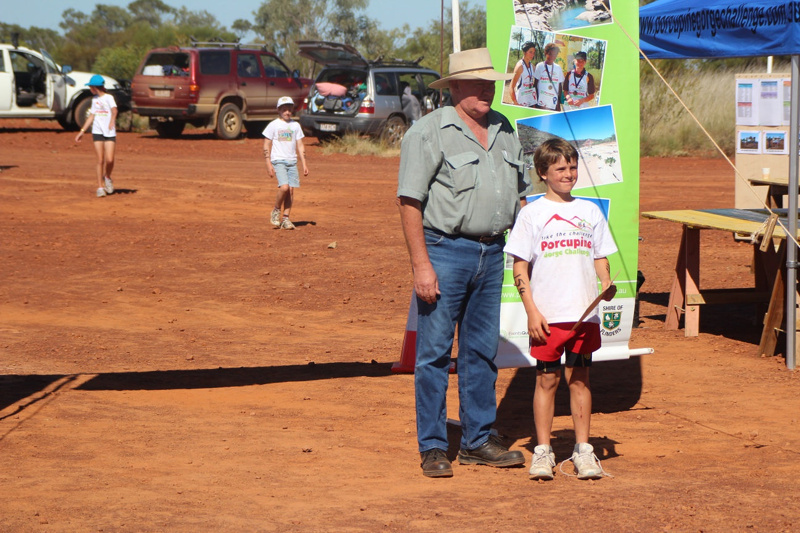 This image depicts the Mt Walker Fun Run Under 12 Boys winner, Will Angus with Councillor Sean O'Neill. The Fun Run took place on 17 June 2012 at Mt Walker, approximately 10km south of Hughenden, Queensland. The Mt Walker Fun Run began in 2010 and is run in conjunction with the Porcupine Gorge National Park Challenge, with the Gorge Challenge run on Saturday and the Mt Walker Fun Run the following day. There are categories in the Fun Run for Open Male, Open Female, Under 16 Boys, Under 16 Girls, Under 12 Boys, Under 12 Girls, Open Team Time, and Under 12 Team Time. In the Under 12 category (boys and girls) competitors are required to complete a 2.4km course, ending at the Mt Walker Lookout. Contributed by Flinders Shire Council.